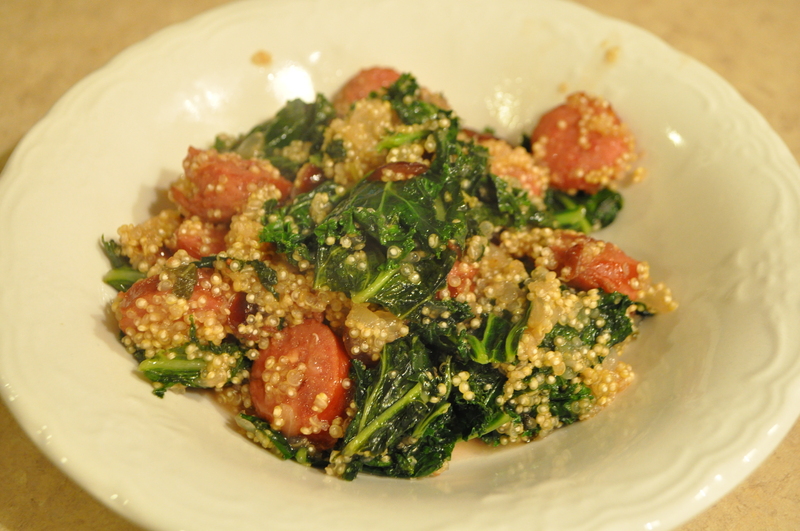 This is a great quick supper with healthy ingredients that combine to create a tasty meal. It doesn’t leave you wanting something else, unless you want another bowl. In a large pot, saute sausage, onions and sage over medium-high heat until just browned. Add juice, quinoa, cranberries, salt and water. Bring to a boil, scraping up any browned bits. Cover, reduce heat and simmer until liquid is just absorbed, about 25 to 30 minutes. Stir in kale, cover again and set aside for 5 minutes to allow the kale to wilt. That looks very good, Anna. I love quinoa. Beautiful dish! Thanks! I really like it too. I had never tried it before this dish and the lovely southwestern salad.